I met Frank Hanley a couple of times back in the early aughts, including one afternoon in Grumpy’s on lower Crescent St. He was holding court, drinking, I think, a club soda. He was, at this point, already in his 90s. But he was irrepressible. Even though he was 96 or 97 when he died in 2006, I was still surprised to hear the news. He got the nickname sometime back in the 1920s or 30s when he was a minstrel player in Montreal, or so he told me. He didn’t know how to play the instrument. Hanley is the kind of guy that doesn’t exist anymore, which is kind of sad. He was the city councillor for St. Ann’s Ward from 1940 until 1970. He was also the MNA for St. Ann’s from 1948-70. He didn’t belong to any parties, he was always an independent. 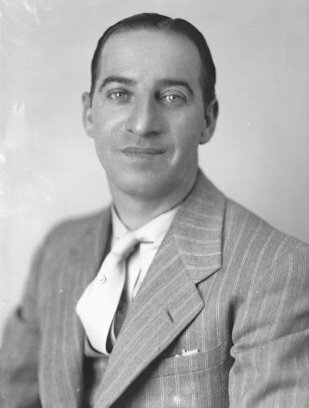 He tended to side with ‘Le Chef’, Maurice Duplessis, in the National Assembly during the 1950s. But I just never could hold that against him. He also despised Jean Drapeau, Mayor of Montreal from 1954-7 and from 1960-86. Griffintown was left to die in the 1960s whilst the other neighbourhoods of the sud-ouest were given makeovers, mostly in the form of slum clearances and the building of housing projects in the Pointe, Burgundy, and Saint-Henri. Griff got the rénovations urbaines part, but that was it. Nothing was built to replace what was torn down. And it was not because of the 1963 re-zoning of the area as ‘light industrial.’ All of St. Ann’s Ward was, as were other parts of the sud-ouest. Griffintown, quite simply, did not attract the attention of hôtel de ville and Drapeau’s team of rénovationistes as a site of investment. The only voice demanding Griff get some love was its councillor: Hanley. Local legend has it that Griff was left to die to hurt Hanley’s re-election chances, such was Drapeau’s enmity for him. Anyway. Hanley was an old school populist politicians, his first real concern was his constituents. And his constituents tended to be poor in Griffintown and the Pointe. He raised money for an emergency fund to help out his constituents when they ran into trouble. Most of this money was raised from other constituents. Occasionally, of course, a few dollars would fall into his own pocket. While today we would shake our heads at this or perhaps bring Hanley up on charges of corruption, in his era, no one had any problem with that. In the summer of 1967, Hanley ran into trouble with Revenue Canada. He had been handing out over $150 per week to his constituents in trouble for much of the past decade, maybe longer. And, of course, he took a bit for himself. 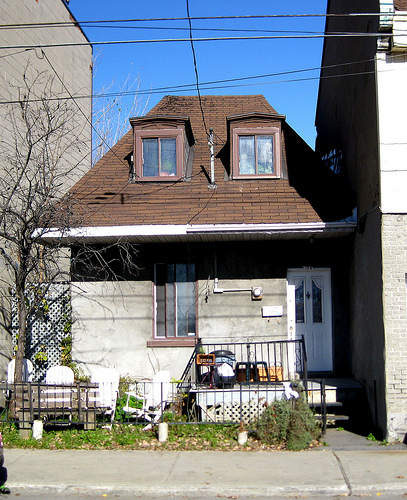 So Revenue Canada threatened to take his house at 500 Dublin St. in Pointe-Saint-Charles. His constituents from Griffintown and Pointe-Saint-Charles had other ideas, and they showed up one morning in Hanley’s yard and proclaimed the ‘Republic of Hanley’ in his front yard. In the end, Hanley and Revenue Canada reached a settlement. The Gazette this morning reports news that the Keegan House just around the corner on rue de la Montagne from Wellington, and across from where St. Ann’s Church once stood, is under threat of demolition from Maitre-Carré, the developer responsible for the condo tower at the corner of de la Montagne and Ottawa. The Keegan House was built sometime between 1825 and 1835 on Murray Street, a block over. In 1865, it was moved to its current site. The house was moved because of the development around Griff. Unlike many other urban neighbourhoods, and unlike the current redevelopment, Griffintown was developed on a lot-by-lot basis. There were not block long, or multi-lot developments as a rule. So as Murray Street was developed, Andrew Keegan, a school teacher, moved his house to a more prestigious locale, across the street from St. Ann’s Church. As David Hanna, an urban studies professor at UQÀM, notes, the block across the street from St. Ann’s was where the nicest housing in Griff was. But that is still a relative statement. Even the nicest homes in Griffintown could not compare with even the swankier locales across the canal in Pointe-Saint-Charles. In recent years, the Keegan House has fallen into disrepair. I was in the building 7 or 8 years ago, and it was in rough shape. Maitre-Carré have bought the lots from 161-75 de la Montagne for redevelopment. Also slated to be demolished is the building that housed what used to be the Coffee Pot, a hangout for Griffintowners across the street from the Church. After the Coffee Pot closed in the early 1960s, the building was split in two, with a dépanneur and a tavern operating there. The tavern limped to its death about a decade ago. Both the Coffee Pot building and the Keegan House were given an unfortunate renovation in the 1950s or 60s, with their outer walls encased in concrete, which greatly diminished their aesthetic appeal. Now what makes this story interesting and oh-so Montréal is that Hugo Girard-Beauchamp, the president of Maitre-Carré, claims that his company has no intention of destroying the Keegan House and, in fact, wishes to incorporate it into the new development. You know what? I believe him. Maitre-Carré and Girard-Beauchamp are the ones were worked with through the Griffintown Horse Palace Foundation. And while he remains a businessman, Girard-Beauchamp was also more than willing to listen to us and even help us preserve the Horse Palace. In fact, I would go so far as to say, at least when I was on the Board of the GHPF, that we would not have succeeded without his help. However. This is Montréal. The borough isn’t sharing the plans for this development. Julie Nadon, the chief of planning for the borough, says they’re “confidential.” They shouldn’t be. Too much of the redevelopment of Griffintown has been done this way. The Ville de Montréal has operated in Star Chamber secrecy, refusing to divulge its plans to anyone other than the developers until it’s too late. A couple of years ago, the Ville de Montréal held a public session at the ÉTS to show off its plans for Griff. It’s plans had already been made with 0 public input. None. At all. Last month, I met Michael Patrick MacDonald at an Irish Studies conference in Rhode Island. He was the keynote speaker. I didn’t know much about him beforehand, other than he wrote All Souls about growing up in South Boston in the 70s and 80s. I knew All Souls was a story about heartbreak, drugs, and the devastation suffered by his family. But MacDonald’s talk was one of the best I’d ever heard, he spoke of Whitey Bulger, drugs, Southie, his work in non-violence and intervention, and he talked about gentrification. He was eloquent and fierce at the same time. He is, of course, an ageing punk. He was also pretty cool to talk to over beers in the hotel bar later that night. I finally got around to reading All Souls last week. I’m glad I did. I was stunned that MacDonald and his siblings could survive what they’ve survived: three of their brothers dead due to gangs, drugs, and violence. One of their sisters permanently damaged by a traumatic brain injury brought about due to drugs. And another brother falsely accused of murder. It was a heartbreaking read, at least to a point. I know how the story ends, obviously. It was also interesting to read another version of Southie than the one in the mainstream here in Boston. The mainstream is that Southie was an Irish white trash ghetto, run by Whitey Bulger, terrorised by Whitey Bulger, but all those Irish were racists, as evidenced by the busing crisis in 1974. And while MacDonald tried to revise that narrative, both in his talk and in All Souls, pertaining to the busing crisis, it is hard to argue that racism wasn’t the underlying cause of the explosion of protesting and violence. But, MacDonald also offers both a personal and a sociological view of how Southie was terrorised and victimised by Bulger (and his protectors in the FBI and the Massachusetts State Senate). And, today, he talks about gentrification in a way that most mainstream commentators do not (something I’ve railed about in my extended series on Pointe-Saint-Charles, Montréal, his blog, Pt. 1, Pt. 2, Pt. 3, Pt. 4, and Pt. 5). But something else also struck me in reading MacDonald’s take on Southie. I found that he echoed many of the oldtimers I’ve talked to in Griffintown and the Pointe in Montréal about their experiences growing up. Griff and the Pointe were the Montréal variant of Southie, downtrodden, desperately poor Irish neighbourhoods. And yet, there is humour to be found in the chaos and poverty, and there is something to be nostalgic for in looking back. I didn’t know if I loved or hated this place. All those beautiful dreams and nightmares of my life were competing in the narrow littered streets of Old Colony Project. Over there, on my old front stoop at 8 Patterson Way, were the eccentric mothers, throwing their arms around and telling wild stories. Standing on the corners were the natural born comedians making everyone laugh. Then there were the teenagers wearing their flashy clothes, their ‘pimp’ gear, as we called it. And little kids running in packs, having the time of their lives in a world that was all theirs. Griffintown had the atmosphere of an old black-and-white movie. Think The Bells of St. Mary’s,with nuns and priests and Irish brogue and choirs singing Latin hymns. Then throw in the Bowery Boys, the soft-hearted tough guys wisecracking on the corner. The difference, of course, is that MacDonald’s ambivalence runs deep, he also sees the drug addicts and dealers, and the grinding poverty. Doyle Driedger didn’t. But, MacDonald is standing in Southie as an adult when he sees this scene, Doyle Dreidger is writing from memory. Nostalgia is a funny thing, and it’s not something to be dismissed, as many academics and laypeople do. It is, in my books, an intellectually lazy and dishonest thing to do. Nostalgia is very real and is something that tinges all of our views of our personal histories. But what I find more interesting here are the congruencies between what MacDonald and Doyle Driedger writes, between what MacDonald says in All Souls and what he said in his talk last month in Rhode Island, and what the old-timers from Griff and the Pointe told me whenever I talked to them. There was always this nostalgia, there was always this black humour in looking back. I also just read Roddy Doyle’s Paddy Clarke Ha Ha Ha, about a kid growing up in Dublin’s Barrytown, a fictional inner-city neighbourhood. Through Paddy Clarke, Doyle constructs an idyllic world for a boy to grow up in, as he and his mates owned the neighbourhood, running around in packs, just like the kids in Southie MacDonald describes, and just as MacDonald and his friends did when they were kids. I don’t know if this is something particular to Irish inner-city slums or not. But I do see this tendency as occurring any time I talk to someone who grew up in such a neighbourhood, or read stories, whether fiction or non-fiction, to say nothing of the music of the Dropkick Murphys (I’m thinking, in particular, of almost the entirety of their first album, Do Or Die, or the track “Famous for Nothing,” on their 2007 album, The Meanest of Times), I’m not one for stereotyping the Irish, or any other group for that matter, I don’t think there’s anything “inherent” to the Irish, whether comedy, fighting, or alcoholism. But there is something about this view of Irish slums. You are currently browsing entries tagged with Pointe-Saint-Charles at Matthew Barlow.